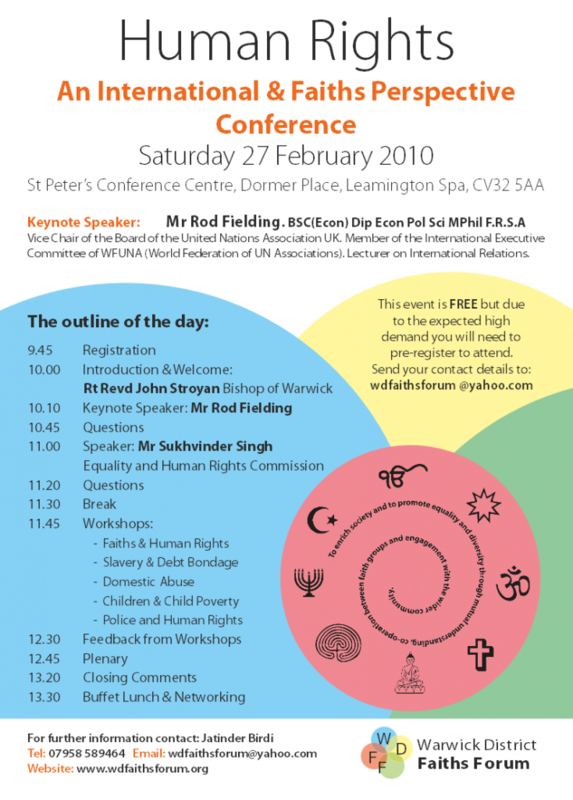 In March 2009, members of the Warwick District Faiths Forum (WDFF) decided that the topic for the Multi-Faith Display at the Leamington Peace Festival should be “Faiths and Human Rights”, focusing on what different Faiths say about how people should be treated. The pictures and texts on the display boards stimulated people to think about how we in the UK actually treat people from different faiths, cultures and traditions. It became apparent that there was a need for people to understand the current Human Rights situations. It was agreed that the best way to raise awareness of Human Rights and issues around the world and locally, would be to have a Conference which would be split into a Seminar and workshops. Action was taken and the conference was organised to take place at St Peter’s Conference centre. After the welcome by Mr Jatinder Birdi, Chairperson WDFF, the Rt Reverend John Stroyan, Bishop of Warwick introduced the topic. It was an honour to have as the keynote speaker, Mr Rod Fielding, Vice Chair of the Board of the United Nations Association UK who detailed the history, development and current issues around Human Rights. He reminded the audience that, on 10th December 1948, the General Assembly of the United Nations adopted and proclaimed the Universal Declaration of Human Rights. Many of us were not around then, and did not know the issues of the time. The second speaker, Mr Sukhvinder Singh, from the Equality and Human Rights Commission outlined the key issues of Human Rights being faced by people in the United Kingdom. 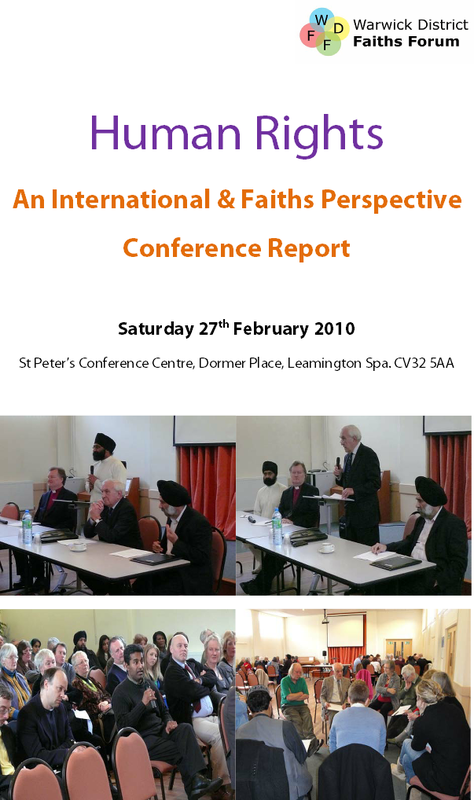 There had not been a similar Conference in the Midlands previously, and a great deal of interest was shown by people from different faiths and backgrounds, including teenagers and older members, from the local community and also from people across the Region. The purpose of the Conference was to raise people’s awareness of issues surrounding Human Rights on an international basis and also to highlight that these issues are not in far away places, but in fact very close to us and effect us in our daily lives. We might consider ourselves as living in a “developed country” but does everyone have equal rights? Do we treat everyone fairly? Do we actual know what Human Rights are? How many people have actually read the United Nations Declaration of Human Rights adopted on 10th December 1948? It is an easy option to think that everything is perfect in our Society, but is it really? Do we not all live in glass houses and it is only when the glass breaks do we realise that there is a problem. The Conference raised people’s awareness of Human Rights, and many questions were pursued, What can our Faith Communities do? Why are people indebted to other people? Why is domestic violence increasing? Why are more and more children living in poverty? Why do we blame the Police when things in Society are wrong and they are protecting others’ Human Rights? These and many other questions were raised and people discussed these in some very lively and constructive workshops. Everyone came away from the Conference with probably more questions than answers and that is right, we need to ask more questions, we need to be more actively involved in issues that affect our everyday lives. We seem to be getting more and more busy and forget about the core principle of equality amongst all, to treat others as we would like them to treat us! The Conference gave the opportunity to key individuals from local Statutory agencies to consult and get the views of members of the public and this two way communication is essential to get information and ideas moving. We now live in a society where we are surrounded by information but how much is relevant and do we actually know what it means? It is only by discussing issues that we can try to solve some of the problems. The Conference only scratched the surface of some of the key issues affecting us, we did not discuss the issue of Climate Change or world conflicts. What is apparent is that we all need to work together to make things better for everyone. Jatinder Birdi, Chairperson of the Warwick District Faiths Forum (WDFF), welcomed the Rt Revd John Stroyan, The Bishop of Warwick, Councillor Norman Pratt, The Chairperson of Warwick District Council, Councillor Penny Bennett, The Mayor of Warwick, Mr Rod Fielding, from the United Nations Association UK, today’s keynote Speaker, Mr Sukhwinder Singh from the Equality and Human Rights Commission, the second Speaker today and everyone in the room for taking time in their busy life and schedule to attend this unique and special Conference on a Saturday morning at St Peter’s Conference Centre in Leamington Spa. It is very good to welcome you here. It is so important to meet together as people of faith. It is so important to unite, where with integrity we can unite to exercise our collective influence – in simple terms- to make the world a better place. I am well aware that there will be people from many of the faith traditions represented here who would not want to be here themselves and nor would they want us to be here. Equally, I am aware that the very concept of ‘human rights’ is regarded as dubious – or even heretical – to some interpreters of our faiths. Some of this scepticism, certainly regarding the term ‘human rights’ is surely understandable given that most faith communities and the sacred texts which inspire them use the language of human duties or even commandments as the foundation for community life in which the well-being of each and all can be and should be realised – and in the secular language of today, their ‘human rights’ should be ensured. For example, what is known as the Golden Rule, ‘Do unto others as you would have them do to you’ reflects that the well-being of each of us and the well-being of community life must involve the valuing and respect of the other one, including the stranger. What I am suggesting is that we can, from our diversity of faith perspectives, recognise common God-given priorities which can and should both allow us and prompt us to work both together and with all people of good will for what in the language of some is called human rights and in the language of all we could perhaps call human dignity. For the three Abrahamic faiths – Judaism, Christianity and Islam – agree that God is the God of justice and mercy. God has made every human being in His own image and therefore of unique value and sacred. For the Christian, the Law of God is summed up in Love of God and of neighbour and the neighbour includes the foreigner or stranger. Islam shares with Christianity and Judaism that God is one of mercy and compassion and that believers, as free moral agents, should work for peace and justice. There is a particular ‘Pillar’ obligation zakat to give alms to benefit the poor. Sikhism affirms the essential unity and equality of all people before God. And there is a beautiful daily Sikh prayer which we might all be able to pray: By thy grace may everybody be blessed in the world. Hinduism upholds ‘the divine qualities of forgiveness, compassion, and the absence of anger and malice’. There is indeed much common ground amidst the very real differences. I guess most of us here would both agree on the urgency of working together with the UN and others to counter the abuse of human rights or human dignity and the building of justice and peace not just locally but internationally. Semantics and theology apart, the values to which ‘human rights’ point, in terms of freedom, respect, dignity and value of every human life are ones which most of the human race across faiths and cultures support. Supporting them is one thing but demonstrating that support, is perhaps something on which we, as people of faith should take a lead.